The new Tropicana package design is an epic, unmitigated failure. AdAge reports that Tropicana’s packaging change was not just a customer-relations fiasco. It was also a financial drain on the brand. Dollar sales of Tropicana Pure Premium dropped 19% from Jan. 1 to Feb. 22 of this year. (Category dollar sales fell 5% in the same time period.) On Feb. 23, Tropicana announced that it was pulling the new design and reverting to the old. 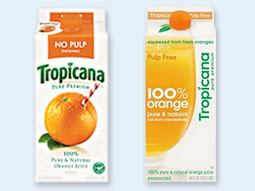 Both designs are shown below, with the original Tropicana package design on the left, and the new (recently removed) design on the right. I can’t think of a bigger design snafu in recent history. And there’s been quite a bit of talk in the marketing community about what exactly went wrong. Consensus seems to be that it’s a failure of marketing research – that research should have kept this design from hitting the shelves. I’ve got a different point of view. There must be a strategic reason for every design choice that you make. If that was the design objective, the increased prominence of “100% orange” makes some sense. But why select an overall design that feels so “generic,” especially for a brand with such a heritage of “premium”? And why, especially, would you walk away from the “straw in the orange”? This was a smart symbol of the purity of the juice inside, and that rarest of things, an ownable element of the visual identity. Worse yet, why replace it with a standard-issue, undifferentiated glass of orange juice? I can’t comment intelligently on whether “pure, natural and squeezed from fresh oranges” is the right message for Tropicana. It’s clear, however, that their design strategy in conveying that message was wildly off the mark. That’s not a research issue – that’s a strategy issue. If you’re going to make major changes to your brand’s visual identity, there must be clear strategic reasons to do so. And if you’re going to walk away from strong elements of your brand’s equity, you had better be VERY certain you’re moving to something even better. What’s your take on the Tropicana redesign? Copyright 2009 – Matthew Fenton. All Rights Reserved. You may reprint this article with the original, unedited text intact, including the About Matthew Fenton section. Although I am not a marketing professional (although some think I may have missed my calling), your opinion of the Tropicana “SNAFU” presents an insight that is logical. When I noticed the change I thought it was a generic brand at first. The straw in the orange is worth a thousand words about the product. Also, it sort of seems like change for the sake of change – without good rhyme or reason behind it. If the motivator was to improve flat sales, it seems the opposite effect, which they achieved, would be very stressing. I hope they take a hard look at this, and quit making excuses for why they fell so short of the mark. Agree with your take and was one of those consumers who voted “no” at the cash register. You’re right…design strategy is at fault here. Why on earth take a “pure” brand with a wonderful symbol of that purity (straw in orange) and remove everything that’s organic about it? The design firm had a brain-fart on an epic scale. And will be remembered for it for quite a long time. Fail. Previous PostPrevious Want better results? Dig deep.